Situated near the airport, this hotel is 2.9 mi (4.7 km) from Cabarceno Natural Park and within 6 mi (10 km) of Santander Ferry Terminal and Isla de Pedrosa. Plaza Méjico and Marqués de Valdecilla University Hospital are also within 6 mi (10 km). Boo Station is only a 5-minute walk. This family-friendly Santander hotel is located on the waterfront, within 1 mi (2 km) of Primera El Sardinero Beach and Palacio de la Magdalena. Santander Ferry Terminal is 1.6 mi (2.6 km) away. Located in Santander City Centre, this hotel is within a 10-minute walk of Mercado La Esperanza and Santander Ferry Terminal. Palacio de la Magdalena is 2.4 mi (3.8 km) away. Santander Station is 8 minutes by foot. Located in Santander City Centre, this hotel is steps from Monumento al incendio de Santander and Santander Ferry Terminal. Palacio de la Magdalena is 2.3 mi (3.7 km) away. Santander Station is 7 minutes by foot. How Much is a Hotel Room in Boo de Guarnizo? Hotels in Boo de Guarnizo start at $47 per night. Prices and availability subject to change. Additional terms may apply. Travelers are in the ideal position when it's time to start finding comfortable places to base yourself in Boo de Guarnizo. Start your research by perusing the 45 hotel choices on Travelocity, all conveniently located within a 6-mile (10-kilometer) radius of the heart of downtown. Boo de Guarnizo has a selection of handy Travelocity-listed rooms, like the Hospedaje Golf and Hotel Sercotel Los Ángeles. The Eurostars Hotel Real is located 5 miles (8 kilometers) away from downtown Boo de Guarnizo. 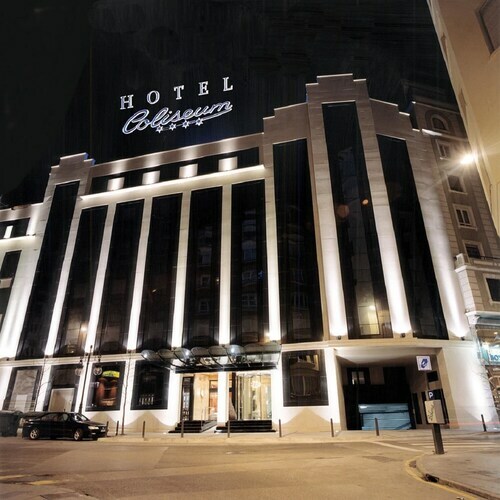 Another option is the Gran Hotel Sardinero, which can be found about 5 miles (9 kilometers) away. Another possibility is to make a booking at the Parador De Santillana De Gil B or the Castilla Termal Balneario de Solares. Once you've really explored Boo de Guarnizo, why don't you discover a little bit more of the area? The Cantabria district is home to countless things to see. Investigate Cantabria's ruins and also fall in love with its beaches. Tireless travelers may engage in mountain biking and mountain climbing in the region. Comillas City Center is 25 miles (36 kilometers) west of Boo de Guarnizo and is home to Palacio de Sobrellano and Capricho de Gaudi. Travelocity-listed Comillas City Center rooms include the Abba Comillas Golf Hotel and Hotel Comillas. 3 miles (5 kilometers) to the south of Boo de Guarnizo, you will find Villaescusa, which boasts the Apartamentos Turísticos Bahía de Boó and Hotel San Juan. The Cabarceno Natural Park and Parque de la Naturaleza de Cabarceno are popular attractions to visit in Villaescusa. If you are passionate about sport and really like matches you and your traveling partner could visit San Mames Stadium, which is found 45 miles (74 kilometers) to the east of Boo de Guarnizo. 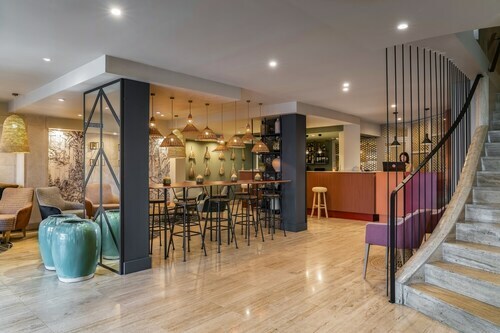 Any sports fans wanting to find Travelocity-listed accommodation options in the area surrounding the game should read about the Gran Hotel Domine Bilbao or the Hotel Miro. If you are flying into or out of Santander Airport and need to book a Travelocity-listed room in the area, why not consider Hotel Silken Coliseum or Hotel Piñamar. 5.0 Very pleasant hotel a few steps from the beach. Every aspect of my stay was very pleasant. Location is great. It is aesthetically pleasing. The food in the restaurant was very good. The "menu of the day" was very good value for the money. Waiters extremely pleasant. The staff was helpful and friendly. Not having a car, the bus stop just across the street was very handy. Good views from the hotel, easy walk to groceries, nice cafe part of the hotel. This hotel reminded me of Marriott Courtyard hotels in the United States. It is located in a business/warehouse district close to the airport. I wouldn't stay here to impress anyone, but if you need a very clean hotel near the Santander airport, I would highly recommend this one. It would be very well suited for a business traveler. The room I had was very modernly appointed. And there's free parking. They offer a delicious breakfast buffet for 10 Euros. The buffet selection had typical Spanish food items like, Jamon, bread, fruit, cheeses, pastries, etc. 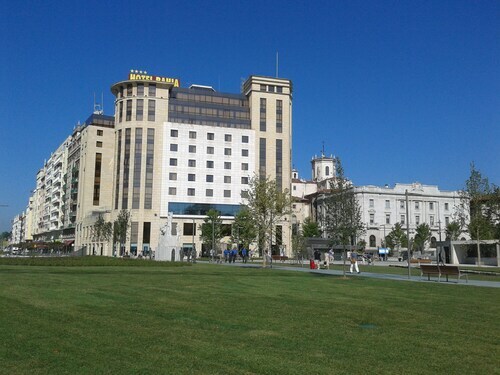 The Hotel Vincci Puertochico is a great place to stay in Santander. It is right on the bay, with rooms with a beautiful view (we got one of those.) Check in was very easy and the clerks all new English well (though I SHOULD have known Spanish!!) The elevator is a little ""cozy"" if you have multiple bags. The room we had was oustanding. Large bed with plenty of pillows, nice bathroom, a small table for ensuite dining and a beautiful view of the Bahia! The breakfasts were very good though a little pricey (13 euros each). In room dining (we did one breakfast and one dinner) was very good with quick, reliable service. The cafe downstairs in the lobby was a nice place to relax with a drink or a coffee/tea/hot chocolate after a day of sightseeing. Checkout was a breeze and they called a taxi for us. All in all it was a very enjoyable stay at a very nice Spanish hotel. We'd highly recommend it to anyone.